In a first-of-its-kind analysis, CUF studied the automation potential of every occupation in New York City, evaluating the likelihood that a machine could perform each job’s component tasks and revealing which ones are most likely to be done by machines in the decades to come. A new Machine Age is coming to New York. From factories, warehouses, and call centers to hospitals, start-ups, and construction sites, automation is reshaping jobs and industries in nearly every corner of the city. But this time is different. Machines are no longer limited to performing repetitive, mechanical tasks, but are capable of learning on the job. As technology tackles more social and cognitive work, its role in the workplace will vastly expand. Some existing occupations will be largely automated in the future, such as movie projectionists, production line workers, and even bus drivers. For most workers—whether attorneys, teachers, or cooks—automation will instead transform their jobs, not end them; more of their roles will be augmented by robots, machine learning, and artificial intelligence. This brave new world will create enormous opportunities while posing new challenges for New York—and it’s already beginning. In a first-of-its-kind analysis, the Center for an Urban Future studied the automation potential of every occupation in New York City, evaluating the likelihood that a machine could perform each job’s component tasks and revealing which ones are most likely to be done by machines in the decades to come. Our study finds that New York City is less susceptible to automation than the nation as a whole. At the same time, more than 456,000 jobs in the city—about 1 in 10—could be largely automated using technology that exists today. (These are jobs in which at least 80 percent of their associated tasks could be done by machines.) This report also finds that the strongest effects are on lower- and middle-income jobs, the first rungs of the city’s economic ladder, where the impact of automation is likely to be significant. To be clear, automation is not expected to eliminate all, or even many, of these jobs. 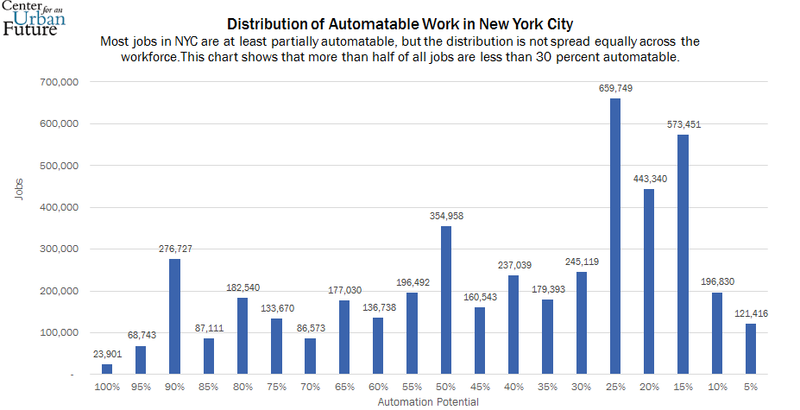 Indeed, this analysis shows that there are only about 7,000 jobs in the five boroughs that are 100 percent automatable. As has been the case since the Industrial Revolution, certain occupations may shed jobs as machines gain ground, but technology is still anticipated to create more jobs than it displaces. In many cases, automation will require humans to work more closely with machines, rather than be replaced by them. This is where policymakers and the private sector should take action, to ensure workers have the technical expertise, education, and training for the workplaces of the future. Nowhere will this be more crucial than for low-wage and low-skill workers. Many of these jobs are already among the most tenuous in the city and will only become more so. Such is the case with the city’s 55,040 bookkeeping, accounting, and auditing clerks, the largest group whose tasks are highly susceptible to automation (86 percent of their tasks could be automated), as are the 49,540 fast food service workers (87 percent automation potential) 40,320 stock clerks (86 percent automation potential), and 14,310 dishwashers (86 percent automation potential). Even so, New York is better positioned than most other places in the United States. Jobs at risk of full automation are rare here, while many occupations that have a significant presence in New York have a relatively low automation potential. In New York, meatpackers and sewing machine operators—whose jobs are highly automatable—are far outnumbered by home health aides, publicists, and graphic designers—all jobs that rely on a human touch. Across all occupations citywide, roughly two in five job tasks in New York (about 39 percent) stand a high likelihood of being automated. That is compared to slightly more than half (51 percent) nationally. Chief executives and actors can expect a high degree of job security, although a quarter of the tasks CEOs do today can be automated in the future. For medical equipment preparers and mail clerks, the potential to be replaced—not just augmented—may be far greater. As with past economic shifts, New York is poised to succeed where others have struggled, though automation is likely to transform jobs for workers throughout the economy. There are only about 7,000 jobs that are 100 percent automatable, but as many as 456,000 could have 80 percent of their tasks performed by a machine. This include positions as varied as bakers, mail clerks, crane operators, and bus drivers. More than 1.4 million jobs, about 1 in 3, in New York City today have the potential for at least half of their job tasks to be automated. About 2.4 million jobs—more than half of all in the city—are likely to be at least 30 percent automated. New York is better positioned than many places in the United States. Roughly two in five job tasks in New York (about 39 percent) stand a high likelihood of being automated. That is compared to slightly more than half (51 percent) nationally. Among the 100 most automatable occupations in the city with at least 500 workers, 51 percent of those make less than $40,000 per year. A further 41 percent could be classified as middle income, making between $40,000 and $80,000, while a remaining 8 percent make more than that. In New York, home health aides are the largest group of workers whose tasks are relatively invulnerable to automation (129,000 jobs; 11 percent automation potential). Bookkeeping, accounting, and auditing clerks are the largest group whose tasks are highly vulnerable to automation (55,040 jobs; 86 percent automation potential), followed by food prep and fast food service workers (49,540 jobs, 87 percent automation potential). Automation will have a considerable impact on salaries citywide, affecting the equivalent of $92 billion in wages—about 31 percent of all income in the city today. Automation is hardly a new phenomenon in New York City. In the days of New Amsterdam, Manhattan had four different windmills producing flour and lumber far more efficiently than human hands, and machines have been winnowing workers on factory and trading floors ever since. In 1947, New York had more manufacturing jobs than Philadelphia, Detroit, Los Angeles, and Boston put together. But despite losing more than 90 percent of these jobs over the past 70 years, the city employs more people today than at any other point in history. In part, this is because the pace of automation has remained far slower in office towers and service jobs than on assembly lines, which allowed dynamic urban centers to thrive, while more rural and industry-dependent communities have struggled to rebound. Yet part of what made cities like New York less susceptible to automation in the past could make them more so in the coming decades. Machines have long excelled at replicating routine, physical labor. Now, computer algorithms are performing social and cognitive tasks of increasing complexity, while fine tuning more complex spatial tasks, whether driving trucks or stocking shelves. The result is that automation has as much potential to remake New York's economy in the information age as it did in the wake of the Industrial Revolution or the postwar era. Among the city’s large, vulnerable occupations are labor-intensive positions like fast food workers (49,540, 86 percent automatable tasks), but also white-collar jobs like bookkeepers and accountants (55,040, 86 percent automatable tasks). A job’s automation potential is defined by McKinsey as the percentage of discreet work tasks that can be performed by machines. In the case of bookkeepers and accountants, nearly 86 percent of current job tasks could be automated using available technology. This does not mean that 86 percent of these jobs are expected to disappear, although some job losses are likely to occur and other jobs will require significantly more tech skills than they do today. Computer scientists and economists emphasize that factors as diverse as technology costs, labor availability, and social and political pressure can all increase or decrease the real-world automation potential of any particular job. On the positive side, many of New York’s fastest-growing jobs, according to the state Department of Labor, are largely insulated from displacement by automation. Among the top 30 expanding occupations, the potential to automate is largely limited to restaurant cooks, where 84 percent of the work could be automated, followed by web developers, at 42 percent. The remaining popular, fast-growing jobs have automation potentials ranging from 24 percent to, in the case of ambulance drivers, zero (while driving is increasingly done by computers, doing so in an emergency to save someone’s life remains highly unprogrammable). At the same time, automation will pose serious challenges to New York, not only because so many jobs are likely to be affected, but because the effects will hit New York’s most vulnerable workers the hardest. The jobs that offer New Yorkers a foothold in the economy—the first rungs to the middle class—are the ones most threatened by automation. Just as automation displaced many of the well-paying, middle-skilled industrial jobs of the past, the low-skilled occupations that are still growing briskly are now poised to be programmed away or transformed into higher-skilled positions with greater barriers to entry. Automated jobs will not vanish overnight. Even among the most automatable work, myriad factors—economic, political, and social—will shape their eventual fates. Consider the city’s 3,600 subway operators, whose work, according to McKinsey, is 94.54 percent automatable. The MTA has been debating such a move for years, but has made little effort in the face of stiff resistance from the Transit Workers Union. Within private sector employment, the pressures could be greater. As machines have gained in dexterity, they are now poised to replace the 8,790 sewing machine operators, the 4,770 mail clerks, and the nearly 60,000 fast food servers and cooks, which are among the 46 local occupations that rank in the 90th percentile for automation. Among the most automatable jobs, production work remains the most vulnerable, whether sewing machine operators (98 percent), meatpackers (96 percent), or welders (92 percent). But service sector jobs are not immune to the forces of automation. Almost 77 percent of the tasks done by the city’s 69,000 waiters could be handled by machines, as could 72 percent of the duties performed by the city’s 21,290 computer support specialists. Indeed, seven of the 15 largest occupations in the top 100 with the highest automation potential are in the foodservice industry, followed by four in transportation and three in office administration. New York already benefits from a lower overall automation potential than the nation, so focusing on its natural strengths in the knowledge and service sectors will be an important factor in the decades to come. Many of the city’s jobs require the social, cognitive, and technical skills not yet easily replicated by machines, including software developers and graphic designers, but also teachers, nurses, and front-line managers in nearly every field. While the city should not ignore more vulnerable occupations, policies and programs that help educate students and retrain workers for positions that have a long-term future—while boosting job quality in the service sector—will be vital components of any strategy to prepare for the changing marketplace. Many positions have the potential for augmentation as much as automation. At Kickstarter, the crowdfunding company headquartered in Brooklyn, the engineering and customer support staff worked together to create a system that sifts through hundreds of queries in a day. Rather than replacing the hands-on work of the customer support team, the machine-leaning algorithm helps classify queries automatically, allowing the team to focus on more complicated requests while generating faster responses to more repetitive and simple questions. In addition, customer support employees have been trained on basic programming skills in order to update the algorithm themselves, making their roles even more valuable to the company. Such ingenuity and adaptability is crucial for the future of work. The potential for expanded opportunities and new jobs is significant, and advances in technology will continue to benefit New York in innumerable ways. But policymakers, education officials, and business leaders will need to help the city adjust by staying ahead of the coming wave of automation. By preparing now, New York can reap the rewards of increased productivity and job growth, while mitigating the painful effects of dislocation on the city’s workers, particularly the most vulnerable ones. City, state, and federal leaders will need to make significant new investments in skills building and education that are just as bold as the introduction of mandatory high school in the postwar era. Too many classrooms remain poorly equipped to prepare students for the coming changes. A more automated economy will necessitate a public education system—both in the P-12 school system and in postsecondary institutions—that is much more closely in tune with the skills young people need for today’s new world of work. As the increasing pace of technological change creates a workplace in constant flux, students should be taught how to keep pace. Critical thinking, problem-solving, and adaptability should join reading, writing, math, and science as the core competencies of an education. Career exploration and work-study opportunities for all students will be more important than ever. Schools and universities should become more responsive themselves. Given the ever-increasing pace of technological change, too many institutions teach programming languages and trade skills that end up obsolete before a student ever sets foot in a workplace. Exposing students to real-world problems through apprenticeships and internships will become increasingly important, and data on in-demand tech skills and occupations can guide the most promising programs for students. This new approach will require a reimagined social safety net. Automation will necessitate a new system of income and work supports designed to help more workers adjust to the coming changes and retrain for jobs that will be augmented by technology. As more workers enter the contingent labor force, innovative approaches like portable benefits may become essential for ensuring that the safety net continues to function. Policymakers will have to find common ground to improve career and technical education and invest in scaling up the programs that work. Although often touted as an essential step in the wake of the free trade agreements of the 1990s and 2000s, there has been little follow-through nationwide. The same mistake cannot be made again. Programs should be informed by real employer needs, aligned with the labor market, and able to build on existing credentials to help meet the shifting demands of emerging technologies. In addition, businesses themselves should do their share, especially as corporations begin to reap the benefits of increased productivity. The IBM-founded P-TECH school in Brooklyn has become a model for similar industry-led investments in career education, offering students advanced training in high-growth fields like tech and healthcare by combining a high school diploma and a no-cost college credential in a single six-year program. This approach could become an aspirational model for public education, especially as college costs continue to soar and college success remains a major challenge for American cities. 1. New York City employment data figures are sourced from the New York State Department of Labor and the U.S. Census.